Proactive data analysis is the most effective of all fraud controls at limiting the duration of and loss related to fraud schemes. According to the 2014 Report to the Nations on Occupational Fraud and Abuse; Copyright 2014 by the Association of Certified Fraud Examiners, Inc., victim organizations that implemented this control experienced 60% less losses and 50% shorter scheme spans than organizations that did not. With our Forensic Data Analytics services we are able to process massive databases and provide our clients with results that are meaningful, understandable and transferable to management, internal audit or investigative teams. The slide shows analyst’s work with i2 using key fraud indicators. The analyst firstly selected a combination of key fraud indicators which would help him detect suspicious insurance claims and direct his further investigation of potential fraud schemes involving insureds and their agents. The analyst chose a combination of the following indicators: “claim under short-term policy”, “accident without impact of vehicles” and “loss within the first 30 days after policy inception”. The indicators were expanded in the i2 programme. When expanded, the claim files for which a particular indicator was triggered were displayed on the analyst’s desktop. For the first indicator 5.986 claim files were identified, for the second 55.313 and for the third 8.074. These claim files clusters are shown on the left hand side of the slide. 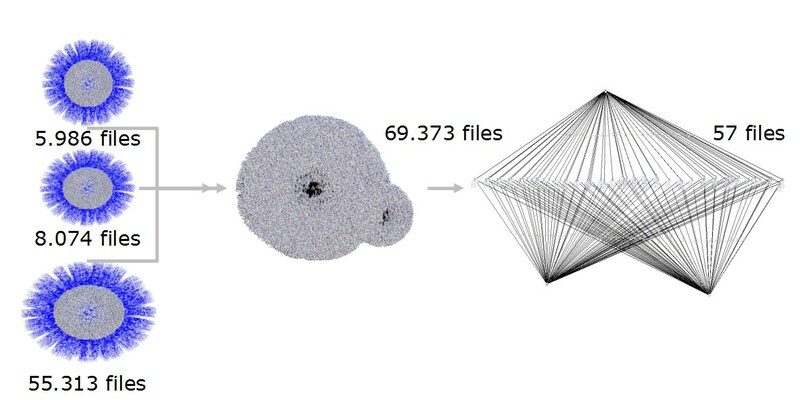 Together, 69.373 claim files were identified, representing a cluster shown in the middle of the slide. From the cluster of 69.373 claim files the analyst selected the files for which all three indicators were triggered. The slide shows 57 such claim files on the right hand side. By expanding the claim files, their respective policies were shown on the desktop together with insurance agents who concluded them. With the help of visualization the analyst searched for patterns that indicate anomalies and potential collusions between the agents and the insureds from high risk claims.